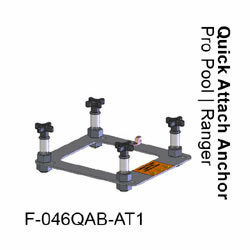 Quick attach anchor kit for Ranger and Pro Pool series pool lifts. Allows your lift to be quickly removed without the use of tools. Not for retro-fit. No need for tools! Designed specifically for use with the Pro Pool™ and Ranger™ pool lifts. Quickly remove the lift from your deck without the use of tools and re-install using the durable, hand knobs to tighten the lift down to the deck. The quick attach anchor kit offers an affordable alternative to a portable unit. Get the most out of your quick attach anchor option by purchasing the Pro Pool/Ranger Transport Cart, to transport the lift from poolside to storage and back again. This option does not affect the lifting capacity of your pool lift.